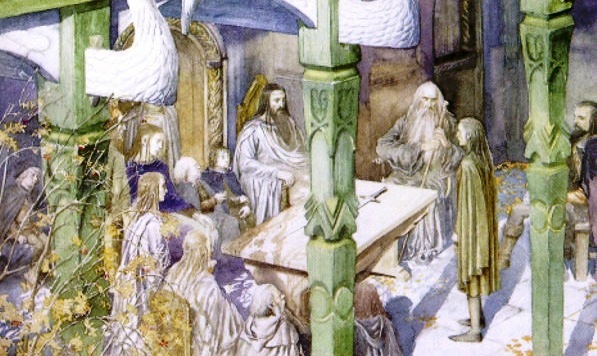 The White Council meets to discuss the Rings of Power. Saruman declares the Ring lost in the Belegaer. Gaffer Gamgee and a few hobbits discuss Bilbo at the Green Dragon. Bilbo continues to write the Red Book. Bilbo and Frodo send out invitations to his 111th birthday party. 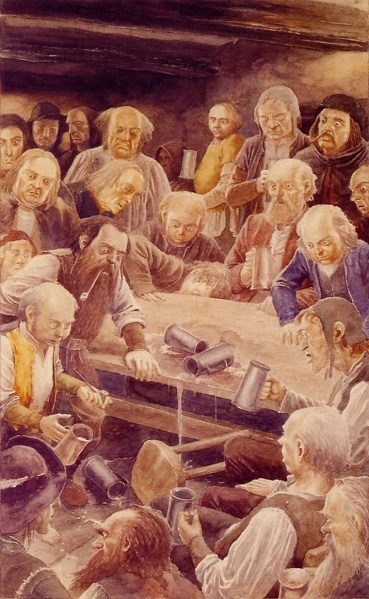 Bilbo and Frodo, along with Sam, Merry, Pippin, Fatty, Gaffer and several other hobbits prepare for the party. Gandalf arrives and talks with Bilbo. Gandalf shows off his fireworks at the party. Bilbo gives a speech. At the end of the speech he puts on the Ring and disappears. After arguing with Gandalf, Bilbo leaves the Ring behind and leaves. Frodo arrives back at Bag End. Gandalf gives him the Ring. The next day Gandalf says he must leave immediately. He tells Frodo not to wear the Ring. 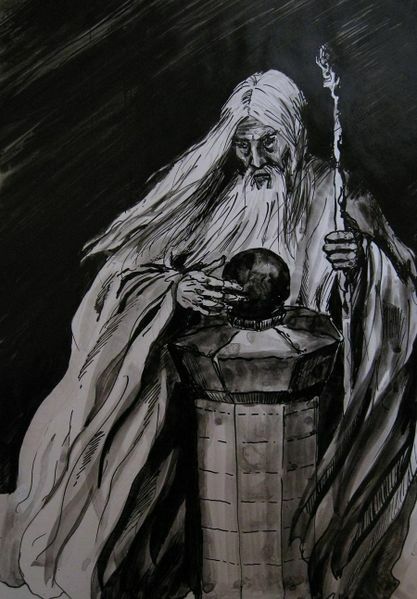 Saruman looks in the Palantir towards Mordor, finding Sauron. Sauron sends out servants to find the One Ring. Gandalf finds and read a scroll written by Isildur about the One Ring. A messenger comes to Erebor to speak with Dain. They mention Bilbo and the Ring. Dain sends Gloin, Gimli and a few others to Rivendell to warn Bilbo. Adapted from chapters ‘A Long-expected Party’, ‘The Shadow of the Past’, ‘The Council of Elrond’ and Appendix B of The Lord of the Rings. Thranduil and an unnamed ranger lead Gandalf to a prison cell, containing Gollum. Gollum tells Gandalf that he had been tortured by Sauron, telling him the words ‘shire’ and ‘Baggins’. Gandalf realises Bilbo’s ring is the One Ring and leaves for the Shire. At the Green Dragon, rumours abound of evil spreading throughout the south. Gandalf arrives at Bag End. He takes the Ring from Frodo and throws it in the fire. The runes that appear confirm that it’s the One Ring. 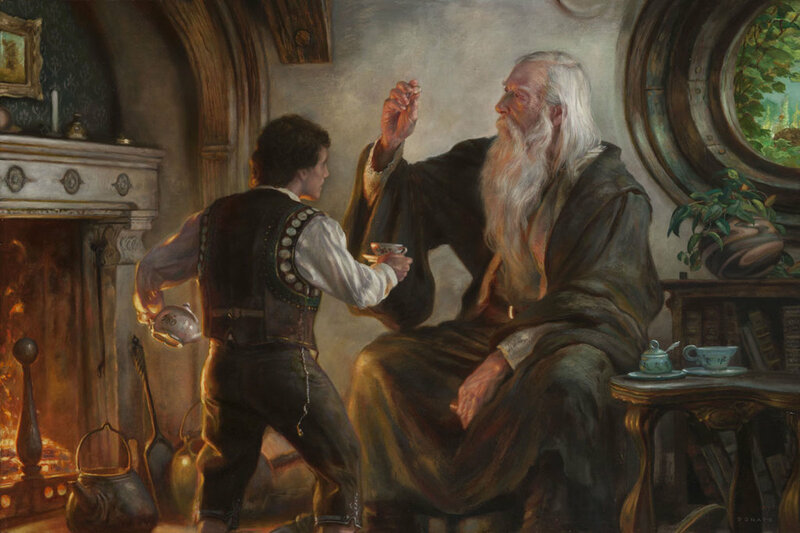 Gandalf explains the history of the Ring to Frodo. Frodo realises he must take the Ring somewhere else. Gandalf recommends reliable companions, soon after catching Sam Gamgee eavesdropping at the window. 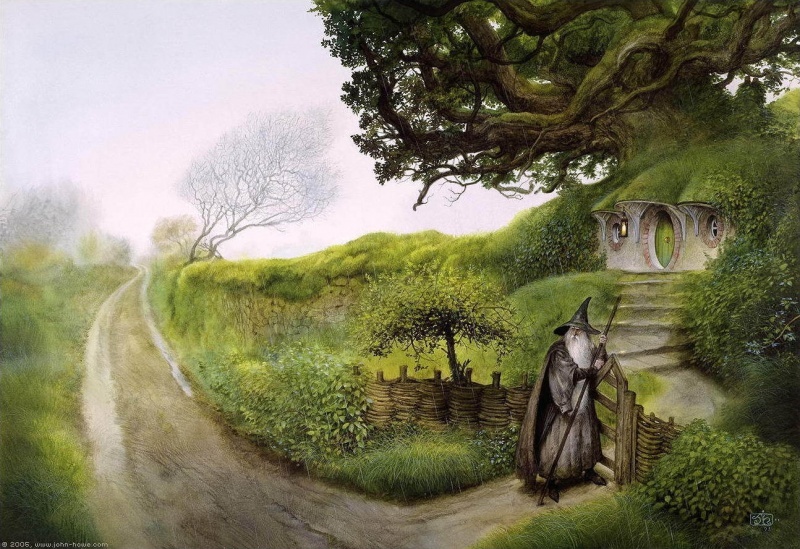 Gandalf leaves to meet with Saruman, telling Frodo to meet him at Bree. 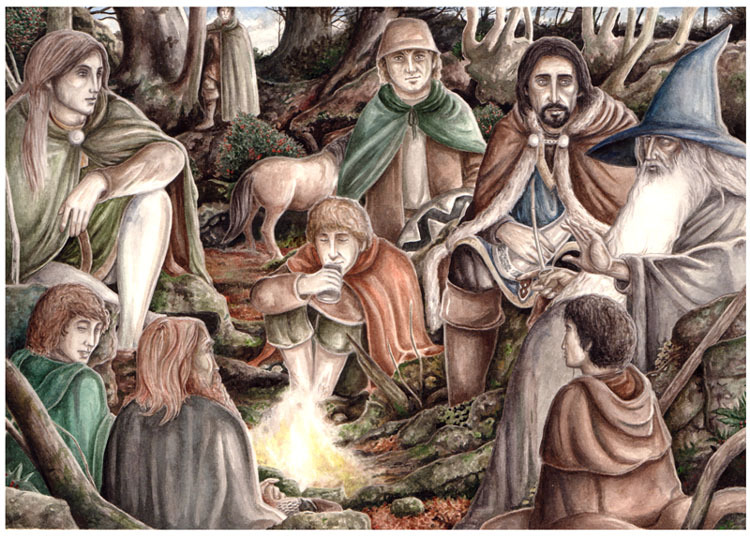 Frodo holds a small gathering for his birthday, telling his friends he well be moving to Buckland. The next day, Frodo sends Merry and Fatty to Buckland with his luggage. As Frodo leaves with Sam and Pippin, he hears a strange voice talking to the Gaffer, asking for Mr Baggins. The three set out towards Buckland. On the road, they hear hooves. Frodo urges them to hide. A black rider appears, stopping where they are hiding, before riding off again. 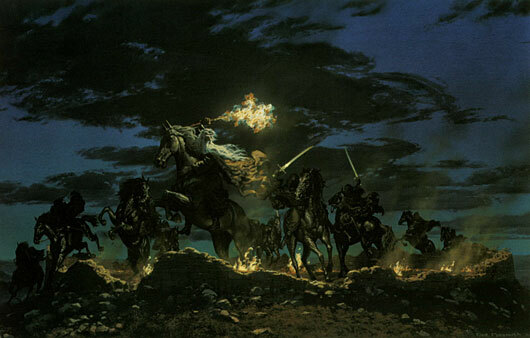 As night falls they come across another black rider, who comes towards Frodo. It rides off once it hears the singing of elves. 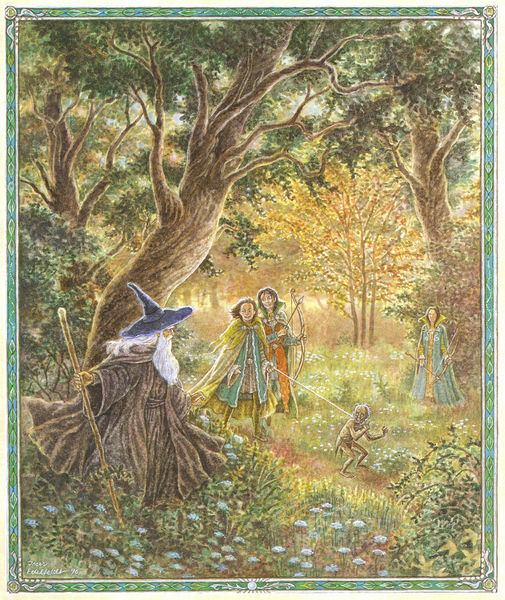 The elves come across Frodo. Their leader, Gildor, explain the black riders as servants of the enemy. They hear hooves in the distance, but it turns out to be Merry. Gandalf comes upon Radagast, who tells him Sauron has sent the Nazgul out. Gandalf has Radagast send a note to Bree. Adapted from chapters ‘The Shadow of the Past’, ‘Three is Company’, ‘The Council of Elrond’ and Appendix B from Lord of the Rings and ‘The Hunt for the Ring’ in Unfinished Tales. The hobbits are given a ride by Farmer Maggot, who tells them of the black rider looking for Frodo. 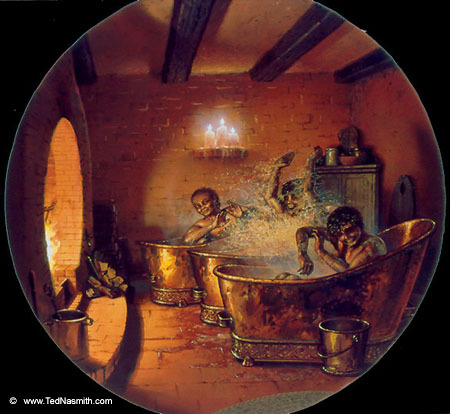 Merry gives the hobbits dinner and a bath. Frodo tells the others he plans to leave, only to have Merry and Pippin reveal they know all about the Ring, thanks to Sam. They insist on coming along. Frodo dreams of a dark forest, a great sea and a white tower. In the morning they leave Crickhollow, leaving Fatty behind. Merry leads them to a path, entering the Old Forest. They lose the path several times, attempting to head north, but the trees block their way. 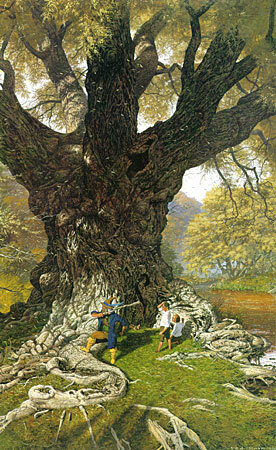 They find the river Withywindle and suddenly feel drowsy, falling asleep against an old willow. Sam goes to find the ponies and when he returns he finds Frodo to have fallen in the river. 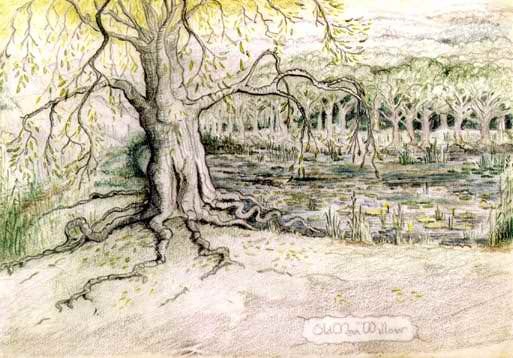 Frodo claims the willow pushed him in and that Merry and Pippin are trapped inside it. They attempt to light a fire but put it out when they hear Merry screaming. Frodo runs to find help, and finds it. 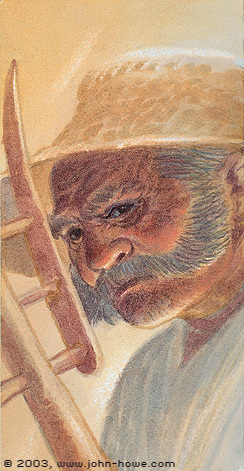 A man called Tom Bombadil. 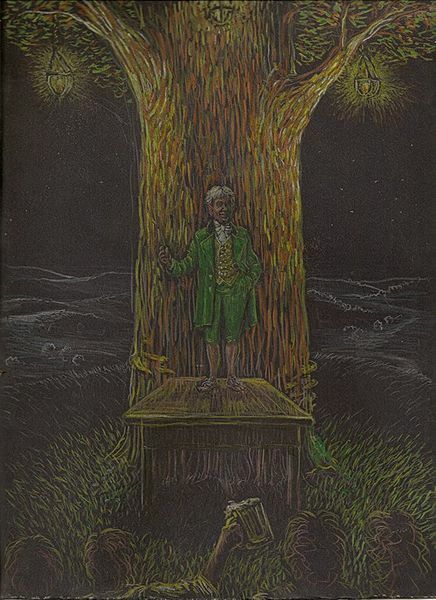 He sings a song demanding the willow free the hobbits, and it complies. Tom takes the hobbits to his house. Gandalf talks to Saruman about the One Ring. Saruman however, desires it for himself. He offers Gandalf to join him and take the power from Sauron. Gandalf refuses, and so Saruman overpowers him and imprisons him on the top of Orthanc. The hobbits eat and sleep at Tom’s house. Tom tells them stories about the forest and the old cities that were built around it. Frodo dreams of a man atop a stone tower. 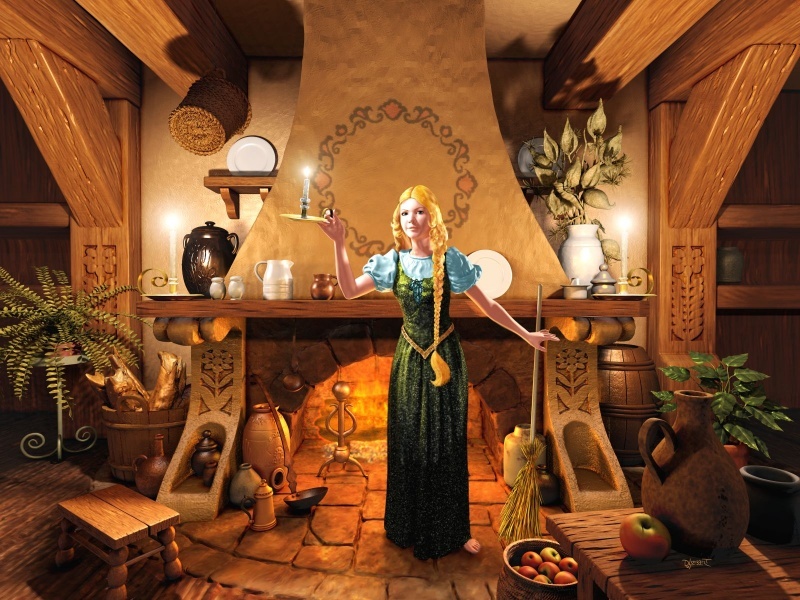 Adapted from chapters ‘A Shortcut to Mushrooms’, ‘A Conspiracy Unmasked’, ‘The Old Forest’, ‘In the House of Tom Bombadil’ and ‘The Council of Elrond’ of The Lord of the Rings. Tom sends the hobbits in the direction of the Barrow Downs. They walk through the fog-covered downs, to where they think they see the end. Frodo sees the exit and rushes ahead, when he turns back he finds his friends gone, with cries in the distance. Frodo hurries back until he finds a barrow. An icy hand grabs him and knocks him out. Gandalf sees the eagles flying nearby. He raises his staff and emits a bright light. Gwaihir notices him and flies to his aid. Frodo awakens in a barrow. He hears a voice chanting and sees his friends lying next to him. 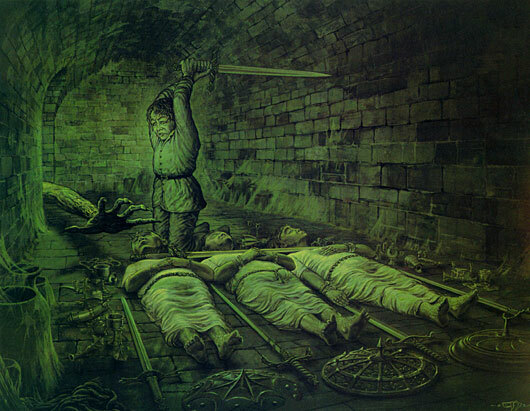 A hand comes reaching for them and Frodo slashes at it with his dagger. Frodo remembers the song Tom taught them and sings it. A voice answers his call. Tom smashes open the barrow and dispels the wight. From the barrow’s treasure Tom takes a brooch and gives the four hobbits a Westernesse dagger each. He accompanies them to the exit then sends them to Bree. Gandalf speaks with the Gaffer, who tells him Frodo has already left and that black riders had been searching the area. Gandalf hurries to Bree. 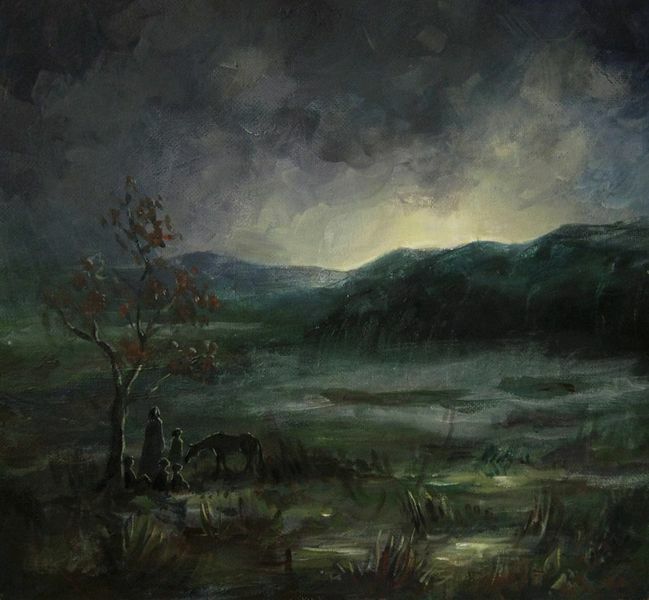 A hooded figure watches the hobbits enter Bree. 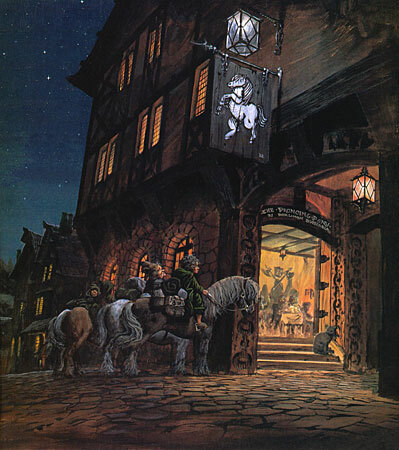 Frodo asks for Gandalf at the Prancing Pony, but he is not there. Merry rests in the room while the other three drink in the hall. 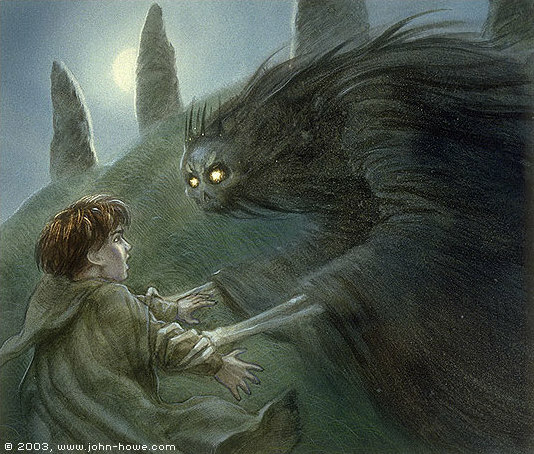 Barliman points Strider, the hooded figure, out to Frodo. Strider makes some comments that intrigues Frodo. 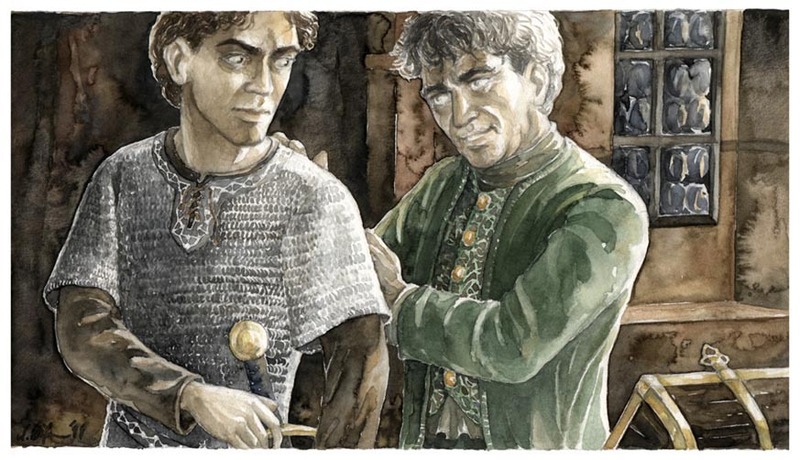 Frodo notices Pippin about to tell of Bilbo’s Ring. Frodo starts singing to distract them but falls and the Ring slips on his finger, astounding the people with his disappearance. Frodo reappears in the corner and hurriedly takes Sam and Pippin back to the room, where Strider appears. Strider tells them of the black riders and that Bree is not safe. Barliman comes to the room with a letter from Gandalf. Gandalf explains that Strider is to be trusted, his real name being Aragorn. Merry, out on a walk, encounters a black rider. He hurries to tell the others. Aragorn leaves pillow decoys in the beds and takes the hobbits down to the parlour. 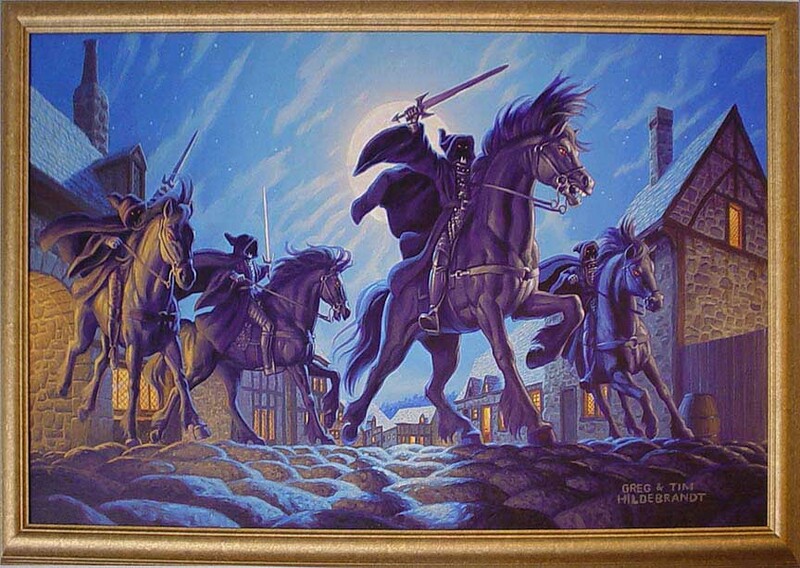 The black riders raid Crickhollow. Fatty flees. 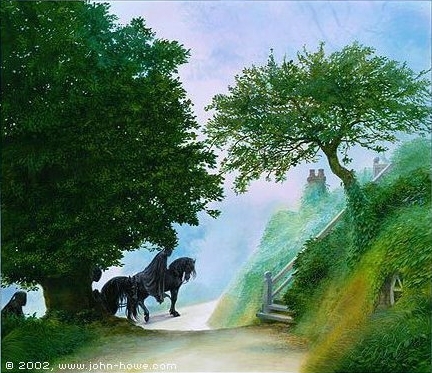 Adapted from chapters ‘Fog on the Barrow Downs’, ‘At the Sign of the Prancing Pony’, ‘Strider’ and ‘The Council of Elrond’ and Appendix B of The Lord of the Rings. 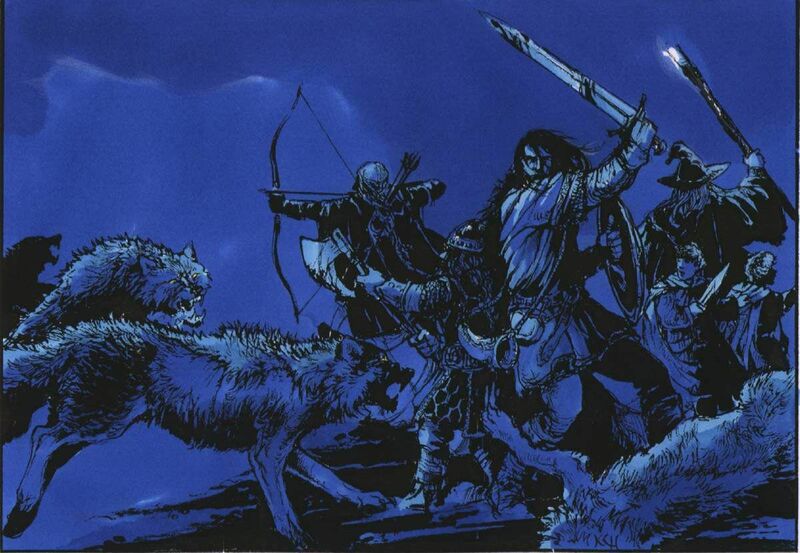 An orc pack attacks Thranduil’s Realm. Gollum escapes. Thranduil sends Legolas to Rivendell with news of the escape. Black riders destroy the hobbits’ room. Sam finds the ponies missing. They buy a malnourished pony from Bill Ferny. Aragorn leads the hobbits away from Bree, with the town watching. Aragorn strays from the road and takes the hobbits through the marshes. Gandalf comes to Bree. He berates Barliman for not sending the letter on. He leaves again. Gandalf rides to Weathertop. He sees no sign of the hobbits, but is ambushed by the black riders. Frodo sees bright lightning and flashes of light in the distance. Aragorn says it appears to be coming from Weathertop. 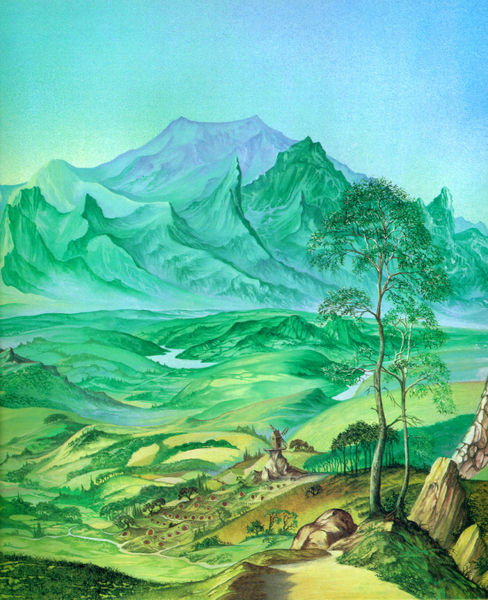 The next day Aragorn and the hobbits arrive at Weathertop. They find a camp and runes on the top, leading them to suspect Gandalf was there. 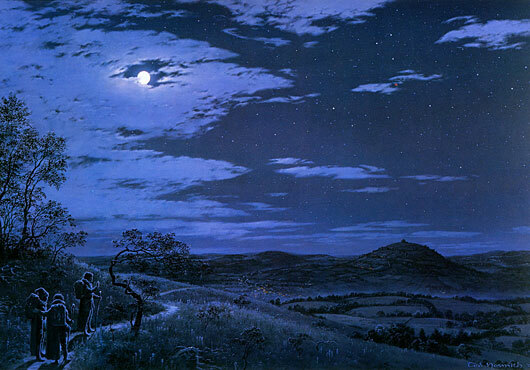 They camp on the side of the hill, where Aragorn tells stories of Luthien. 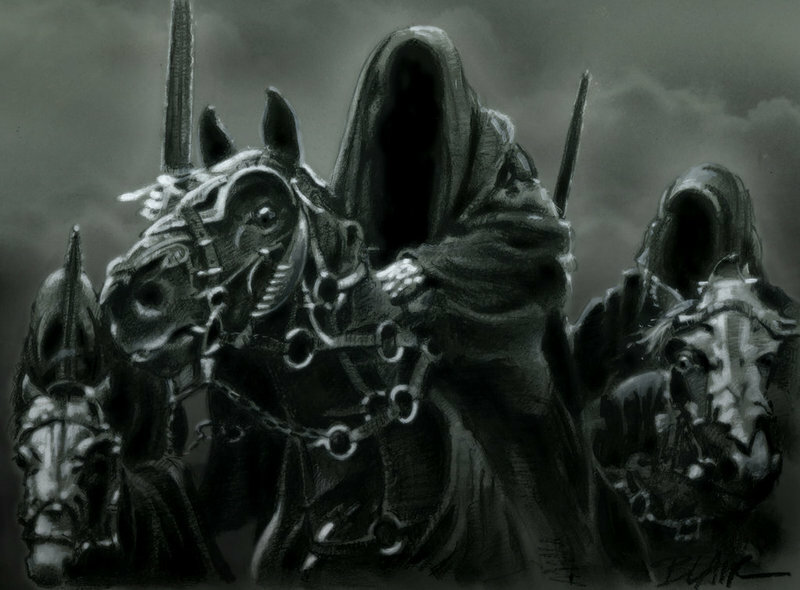 Black riders invade the clearing. Frodo puts on the Ring and gets stabbed in the shoulder. Aragorn drives off the Ringwraiths with fire. Aragorn tries to heal the wound with athelas. He leads the hobbits away from Weathertop. Aragorn finds an elfstone in the road. They come upon the stone trolls. Hearing hooves, they hide. 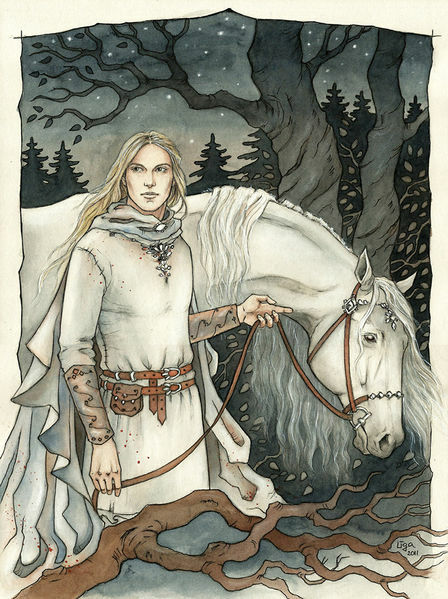 The rider is Glorfindel, of Gondolin. He puts Frodo on his horse and leads them on. 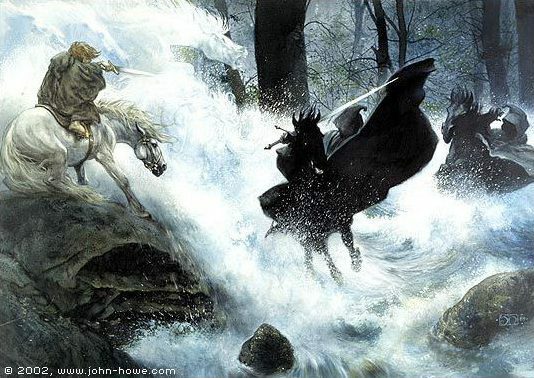 Hearing black riders behind them, Glorfindel calls his horse to carry Frodo across the Ford. 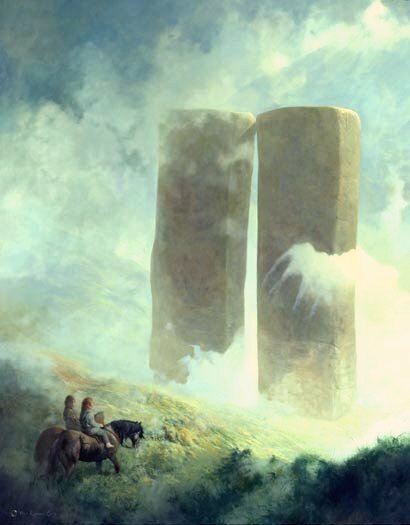 At the Ford, Frodo turns back and defies the Ringwraiths. 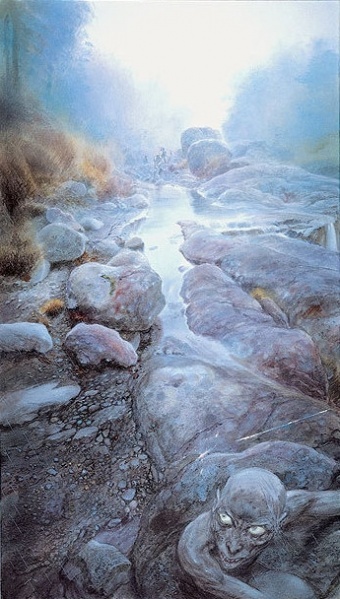 Glorfindel comes up behind them and they begin to cross the river. A rush of water engulfs them. 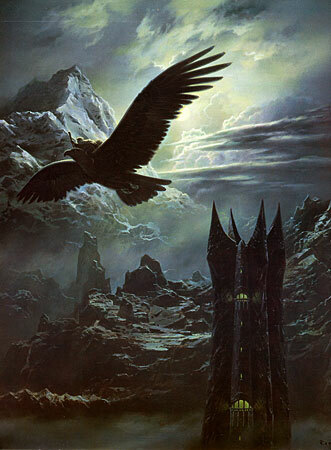 Adapted from chapters ‘A Knife in the Dark’, ‘Flight to the Ford’ and ‘The Council of Elrond’ of The Lord of the Rings. Glorfindel carries Frodo to Elrond, who begins to heal him. Aragorn and the hobbits are welcomed by Gandalf. Legolas, Gloin and Gimli, and Boromir arrive in Rivendell. 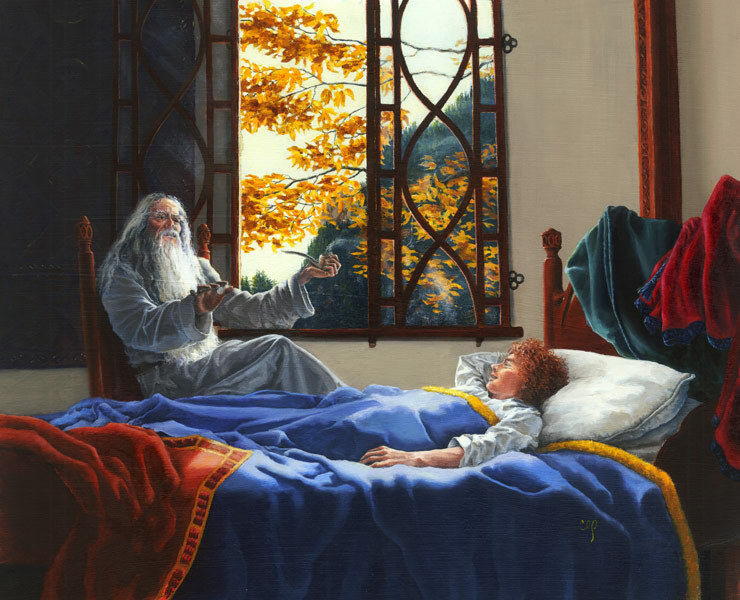 Frodo awakens two days later to find Gandalf sitting nearby. Gandalf explains the Ringwraiths, Frodo’s wound and the flood at the Ford. 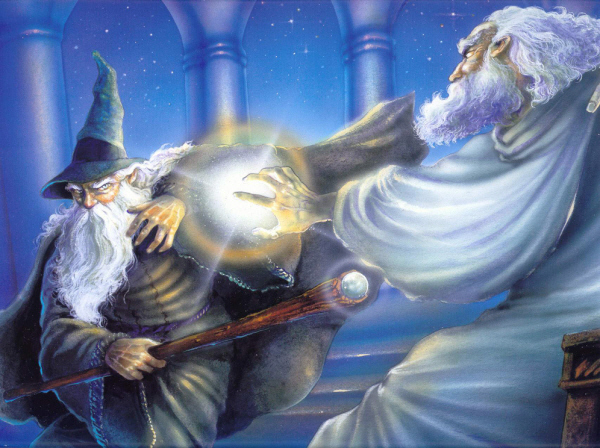 Gandalf takes Frodo to the Hall of Fire, where he finds his friends. Among the guests he also finds Gloin and Bilbo. They talk of Erebor and Bilbo’s work, including A Elbereth Gilthoniel. Glorfindel explains to Frodo how he returned from death. 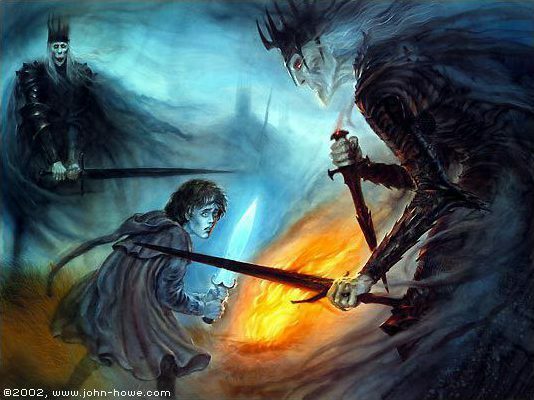 He also tells of the Ringwraith that stabbed Frodo, the Witch-King, and the battles of Arnor and Angmar. He claims the Witch-King will not fall by the hand of man. Aragorn helps Bilbo with his poem and then talks to Arwen and Elrond. Elrond reasserts his condition for Aragorn and Arwen to marry: Aragorn must become King of Gondor and Arnor. The next day, Gandalf takes Bilbo and Frodo to the Council of Elrond. Elrond states the purpose of the Council and introduces Frodo and the Ring. Gloin tells of the messenger that came to Erebor and Legolas tells of Gollum’s escape. Elrond relates the history of the Ring. Afterwards Boromir tells of his dream. Aragorn reveals the shards of Narsil. Gandalf tells of Gollum and the treason of Saruman. The Council debates on what to do. Boromir suggest using the Ring for good, while Glorfindel suggests throwing it in the sea. Elrond declares it must be destroyed in Mount Doom. Bilbo, despite his age, volunteers to take the Ring. Gandalf says he cannot, and so Frodo volunteers instead. Sam bursts forth from hiding and says Frodo will not go alone. 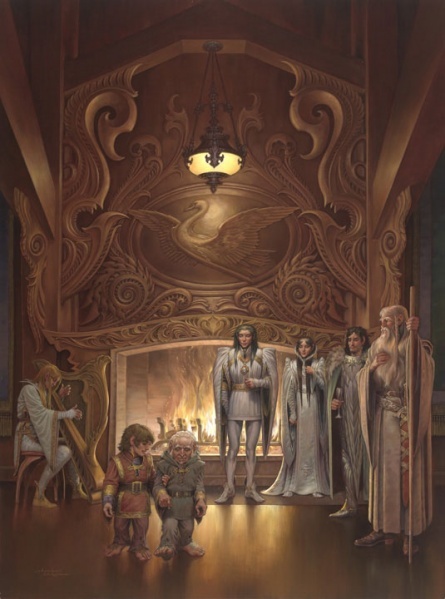 Adapted from chapters ‘Many Meetings’ and ‘The Council of Elrond’ and Appendix A of The Lord of the Rings. The hobbits talk in their room after the Council. Merry and Pippin are upset that Sam has been chosen to go and not they. Gandalf tells Frodo that he and Aragorn will accompany him. Elrond meets with the other members of the council. He asks for volunteers to help Frodo. Gimli, Legolas and Boromir volunteer. Glorfindel and his scouts return. He informs Elrond that there is no news of the Ringwraiths in any direction. The seven members of the company prepare to depart, yet Elrond wishes for two more to raise the number to nine, to match the black riders. He asks Glorfindel, but he and Gandalf say Merry and Pippin should go instead. Bilbo gives Frodo Sting and his mithril vest. 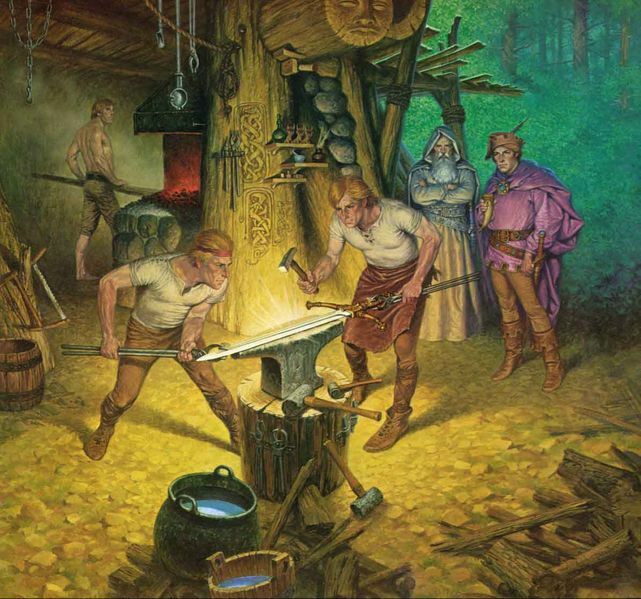 Elladan and Elrohir reforge Narsil. Aragorn renames it Anduril and carries it with him. Frodo says goodbye to Bilbo and Aragorn to Arwen. 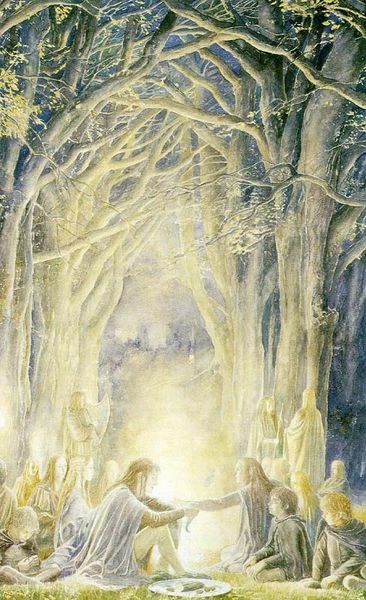 The company leave Rivendell. Aragorn has a feeling they are being watched. Overhead, they see crebain. Gandalf fears they are spies of Saruman and so they hide. A dark shadow flies overhead. Gandalf decides not to pass near Isengard. Aragorn says they should cross over Caradhras, but Gandalf suggests going through Moria. The company attempt to pass over the mountain. A great storm attacks the mountain, which forces them to turn back. Boromir and Legolas argue over the way to go. At camp in the snow, they are attacked by wolves. 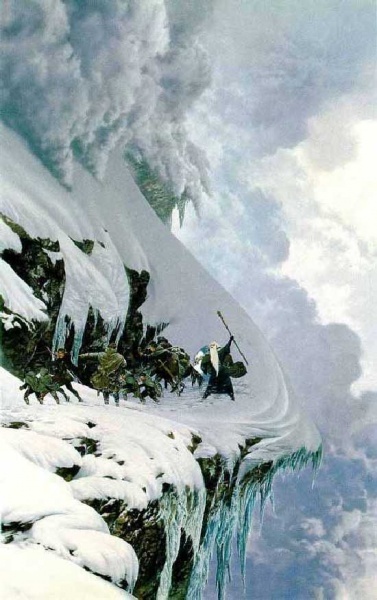 The company drives them off, but they are forced to follow Gandalf to Moria, despite Aragorn and Boromir’s objections. Adapted from chapters ‘The Ring Goes South’ and ‘A Journey in the Dark’ of The Lord of the Rings.